Years ago, loading equipment consisted of a group of men that were paid to load and unload trucks and rail cars by hand. It was a slow, back-breaking process that was also time-consuming. Loading dock workers often experienced back injuries. Some smart person saw there was a need for some sort of loading dock equipment to help with the loading and unloading of freight. And the loading equipment industry was born. Most large freight shipments are on pallets. There was once a time when warehousemen would have to break the pallet down in the truck or railcar, box by box and move it to its temporary location in the warehouse, by hand. But the invention of the pallet jack allowed them to lift the whole pallet and move it to that location, saving incredible amounts of time and labor. Now there are a variety of different types of pallet jacks, but the two basic types are manual (where the operator pumps the handle to lift the load and then pulls/pushes the load where it needs to go) and electric pallet jacks (where all operations are controlled by buttons and the operator either walks behind/in front of, or rides the jack with the load).Pallet jacks are one of the most useful pieces of loading equipment out there, since they can go places that heavier equipment can't go. Basically, a forklift is just a motorized (battery-powered or gas-operated engine) forklift with a much higher lifting capacity. There are two basic types of forklifts as well. There are those that the operator sits on and drives like a car and those where the operator stands and drives the lift. 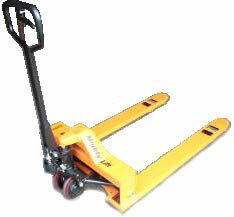 These are also further broken down into regular, or low-lift, and high lift forklifts. The introduction of sixteen foot tall warehouse racking made the high-lift type a requirement. Typically, the stand-up forklift is used for moving material around inside the warehouse and the shorter sit-down forklifts will be used to move freight in and out of the trailers. If you've spent any time at all in the freight or warehouse business, you've experienced an occasion where a driver has dropped his trailer at an angle to your dock, or more than a foot a way from it, if you've got a dock ramp, the gap is bridged. No more having to rock the pallet jack or forklift back and forth to get the wheels unstuck or having to hand unload the trailer to the dock. This type of loading equipment also comes in two basic types: the mobile kind, small and man-portable, and the built-in kind that are an integral part of your dock. Many palletized loads are made up of a number of boxes of different sizes and have to be shrink-wrapped before they're loaded in the trailer. The pallet turntable is a piece of loading dock equipment that automates that process. Place the pallet on the turntable, slip the end of the shrink wrap between two boxes, and push a button. The turntable does the rest.